Background Historically, mental health research has been strongly influenced by the underlying positivism of the quantitative paradigm. Quantitative research dominates scientific enquiry and contributes significantly to understanding our natural world. It has also greatly benefitted the medical model of healthcare. However, the more literary, silent, qualitative approach is gaining prominence in human sciences research, particularly mental healthcare research. Aim To examine the qualitative methodological assumptions of phenomenology to illustrate the benefits to mental health research of studying the experiences of people with mental illness. Discussion Phenomenology is well positioned to ask how people with mental illness reflect on their experiences. Phenomenological research is congruent with the principles of contemporary mental healthcare, as person-centred care is favoured at all levels of mental healthcare, treatment, service and research. Conclusion Phenomenology is a highly appropriate and suitable methodology for mental health research, given it includes people’s experiences and enables silent voices to be heard. 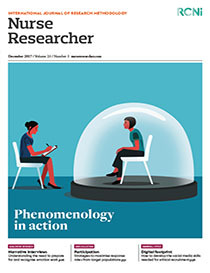 Implications for practice This overview of the development of phenomenology informs researchers new to phenomenological enquiry.